King County homeowners and homebuyers have another new option as Rebls—a matchmaking service for off-market homes—officially launches today. I connected with the Rebls team a few months ago and have had a few conversations with its founders Bryan Copley and Jeff White. What they’re doing is an interesting and unique approach to buying and selling. On the surface it sounds a lot like Zillow’s “Make Me Move” (a.k.a. “Subject Me To Endless Pitches From Real Estate Salespeople”), but Rebls is going much further, and putting much more control in the homeowner’s hands. Rebls aims to improve the home buying and selling process for everyone by making more homes available and empowering consumers to take control in a way that isn’t possible in the current real estate market. 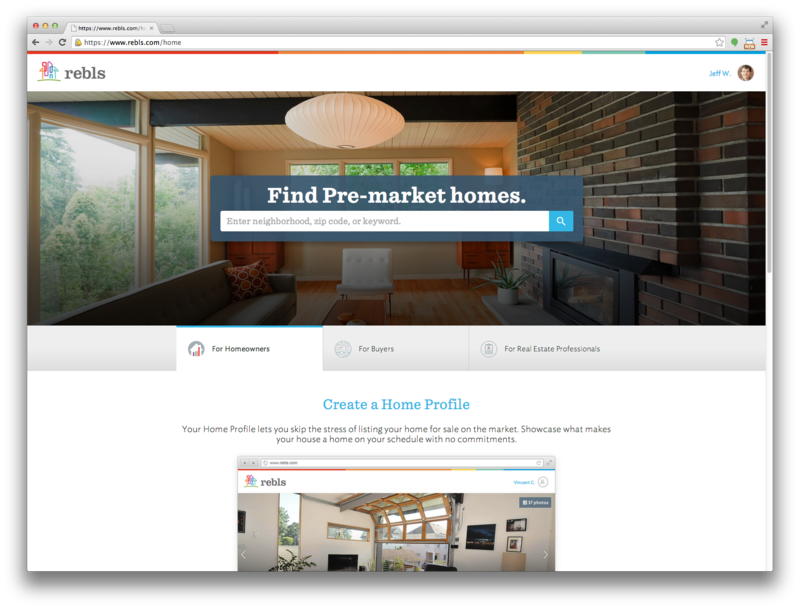 They’ve been testing their site and building out core features for a few months, and as of today they are launching in “open beta” for all King County homeowners and home searchers. Create an account for free and try out the site for yourself. In the midst of planning their big launch, the team at Rebls took the time to respond to some questions I sent their way. The full interview is below. What is Rebls doing that’s new, different, and interesting? Rebls is revolutionizing the way homes are bought and sold. In the current market, it’s too stressful and expensive to find out if you can sell your home. We’re changing that by enabling any homeowner to create a simple home profile that allows them to instantly see who wants to buy a home like theirs. No staging, no listing, and no commitments. On the other side of the coin, there simply aren’t enough homes on the market for buyers to have a high likelihood of landing their dream home. We solve that by giving buyers access to PreMarket homes they won’t find anywhere else—more homes will be available, and in a more accessible format than ever before. How did Rebls come about? What was the inspiration? Bryan’s aha moment came when one of his earliest mentors took him outside, pointed up and down the street, and asked him a simple question: which of these homes are for sale? Bryan did what most people would do. He pointed to each house that had a “for sale” sign in its front lawn. His mentor corrected him with the simple truth that sparked Rebls—every home is for sale. In 2013, Bryan met Jeff who had recently purchased a home and left the experience feeling that the real estate process was broken. Jeff’s takeaway acted as the perfect complement to Bryan’s vision; it should be easier, it should be simpler. Jeff left Amazon, where he worked as a Senior UX Designer for Kindle and as the Interaction Design Manager for the Fire Phone, to become Rebls’ Co-Founder & Creative Director. Why are you launching here in the Seattle area to start? We’re launching in King County first so we can dedicate all our energy into creating an amazing real estate experience for people looking to buy or sell in the Seattle area. When the time is right, we’ll expand Rebls into more areas. Why should a homeowner create an account on Rebls? A homeowner should create an account on Rebls to learn valuable information about demand for their home without having to list it for sale on the market. Rebls makes it easy to see who’s shopping for your home and find your own buyer if you’re interested in selling. Rebls is valuable for all homeowners, even if they’re not interested in selling at the moment. For most people, buying and selling a home is one of the largest financial and emotional decisions they’ll ever make. Rebls allows users to keep a pulse on buyer demand for their home with minimal effort. Rebls is about more than just enabling homeowners to sell through a simpler process and to a broader audience. We empower users to make the most critical decision of all: when/if to sell. What benefits would a homeowner get from having an account? One of the benefits we haven’t named yet is Buyer Matches. Rebls matches buyers and homeowners through a percentage based system—think Match.com, but for homes. As a homeowner, you can see that a buyer on Rebls is a 95% match for your home, and are given the tools to reach out to that person directly. What is Rebls’ relationship with agents? Real estate agents are a valuable resource for buyers and homeowners, serving four core functions: matchmaker, educator, negotiator, and transaction coordinator. Of these responsibilities, matchmaking is the most time and energy intensive. Rebls streamlines this process by allowing homeowners and buyers to connect directly. This saves the agent a significant amount of time, which makes it easier for them to offer a reduced commission. Rebls is establishing a network of partner agents from brokerages across King County who have agreed to offer reduced commissions for homeowners and buyers who find each other on Rebls. What’s your response to Spencer Rascoff’s assertion that all startups that address real estate commissions are doomed to fail? Spencer underestimates the power of the consumer to influence pricing in any industry, and the willingness of the consumer to adopt technologies that will save them money, much less tens of thousands of dollars. He also doesn’t address time savings as an item of consideration in whether an agent would accept a lower fee. If an agent could do 1/2 their usual work for 2/3 their usual fee, why wouldn’t they? Sum up the big idea you’re trying to realize with Rebls. It all stems back to Bryan’s vision: every home is for sale. Buying or selling a home is the single most impactful decision many people will make in their lives. Rebls aims to improve that process for everyone by making more homes available and empowering consumers to take control in a way that isn’t possible in the current real estate market. All while staying true to Jeff’s driving goal; it should be simpler, it should be easier. Rebls has been making rapid improvements and additions since this story was posted a month ago. In addition to expanding to Snohomish and Pierce Counties, they have also added a feature that lets homeowners type in their address and see how many people are searching for a home like theirs. Finally, they also launched the first iteration of agent profiles with “early adopter agents who really embrace the Rebls mission.” Agents on Rebls all offer reduced commissions to homeowners and buyers who find them through Rebls (commission range is indicated up front in an agent’s profile). Welcome to the dance and good luck. I fear you will find that the majority of real estate consumers are not as discerning as you expect (based on your use of the word “revolutionize”). We’ve been in business since 2009 with an alternative model (and our law firm since 2005) and it never ceases to amaze me how ill-informed people are about commissions. The vast majority simply accept the status quo when it comes to the 6% commission paradigm and do not realize that commissions are negotiable. And this is in Seattle, arguably the most progressive real estate market in the country. I can imagine that as part of your market research you’ve had many conversations with consumers in which they say, “real estate agents are overpaid, I can do all the searching myself, etc.” You’ll get pretty much universal agreement on that from everyone except real estate agents. However, what people say and what they do are often two different things. The National Association of Realtors takes great pride in the “fact” that the percentage of FSBOs has declined while agent-assisted transactions have gone up since the Great recession. Commission rates have also gone up rather than down during that time. That doesn’t bother us in the slightest because the niche market for consumers who do figure it out is still pretty big and we’ve got a very appealing offering. Discovery and education are our biggest challenges and opportunity. In your previous posts about Zillow one of your primary concerns was the source of their revenue stream. I may have missed it in your post but I don’t see who pays Rebls? How do they make their money? Don’t trust websites, advertisements or even verbal descriptions given to potential customers. Invite them to a quiet place to chat, perhaps lighten them up with a drink or two. Its amazing what this truth serum reveals…. I am starting a somewhat similar business with some acquaintances in New Jersey. We had to ensure that our “You Were Moving Out, Right?” feature didn’t violate Zillow’s “Make Me Move.” Basically, if you see a house you want to buy, but it isn’t up for sale, our company can convince the current occupants to leave, and quickly. Our fees are reasonable. A few of the guys really enjoy the work. RE: Ardell DellaLoggia @ 2 – Thanks for the question, Ardell. Rebls will monetize by advertising professionals to our community of users. Real estate agents and lenders will pay a monthly subscription fee, and will get an unlimited number of leads from our service. We don’t charge per zip code or lead. It’s worth noting that users on our site initiate contact with professionals (versus the other way around). We’ve done this to encourage people to interact without being concerned about pressure to move faster than they want to. As a professional, if you get a message from a user, it’s because they want to discuss working with you. RE: Ardell DellaLoggia @ 2 – My beef with Zillow’s model is that they present an incomplete & inaccurate collection of data to home searchers then charge real estate agents to put their face next to those listings in order to generate leads. They’re literally just a middleman on top of (a broken version of) the existing system. In contrast, Rebls is creating an entirely new system, then, as Bryan explains above, charging agents to access this system and make themselves available to the buyers and sellers who have connected and are looking for professional help to close the deal. I don’t know if Rebls would explain it this way, but I think what they’re doing is more similar to what an MLS does than what Zillow does. The difference of course being that the MLS is centered around agents and Rebls is centered around the home buyers and sellers. Thanks for your comment, and for sharing your experiences. Real estate agents who advertise on Rebls agree with our ethos that if a buyer and homeowner have done a considerable amount of the workload in putting together a transaction, an agent can and should discount the commission from the standard 6%. Over the past two years, as part of the customer development process, Rebls listened to many agents at a variety of brokerages who we were delighted feel the same way Peter Mann does. If the buyer and seller have done too much of the work, the agent will be involved in the unauthorized practice of law–something Marc doesn’t have to worry about. RE: Kary L. Krismer @ 8 – Can you elaborate, possibly with a hypothetical example? As a non-lawyer I’m not really clear what you’re alluding to here. So as a seller, I still must pay a commision to the buyer’s agent in order to use your service? What if I don’t want to use a seller’s agent, but instead want to just pay my RE attorney an hourly fee to handle the transaction? Tim is angry with them because they aren’t collecting the data precisely enough. There is no deeper meaning here. He wants the data collected better. RE: The Tim @ 9 – Agents are authorized to fill in standardized forms as part of their brokerage practice, without charging an extra fee for doing so. At some point where a buyer and seller have already reached a deal, the agent risks the unauthorized practice of law by assisting a buyer or seller because almost all that’s left is the drafting of the contract. I’ll use a real example. A few years ago someone from SB called me wanting my help in buying a property. They had already come to terms with the seller and so all they needed was the drafting of a contract and perhaps help selecting an inspector. I told them to contact an attorney to draft the contract. My concern was not only that they could get the contract drafted by an attorney cheaper, but also that by being involved in such a limited capacity that my firm’s malpractice carrier might consider it just the practice of law. If I had not also been an attorney I would have also needed to worry about the WSBA and the King County prosecutor. I know there are some agents out there who will help draft contracts for a relatively low amount. IMHO they should not be doing so. RE: Ardell DellaLoggia @ 2 Real estate agents and lenders will pay a monthly subscription fee, and will get an unlimited number of leads from our service. This finally cuts to the chase and explains what it is. A homeowner logs in and indicates he might want to sell. Agents vie for his business. It’s nothing more than a listing service. Instead of calling agents and indicating an interest in selling, I do it on a web site. Ho hum. Nothing really exciting happening here. PS – Saying every house is for sale is nothing new either. Our old friend David Losh always said if you want a house, knock on doors and ask people if they want to sell. Good luck with your IPO. In this crazy world you’ll probably make a killing without ever breaking even. RE: wreckingbull @ 10 Thanks for the question. Homeowners or buyers on Rebls are under no obligation whatsoever to work with any partner agent on our site. If you’d prefer to use a real estate attorney we encourage you to do what’s best for you. This is an aspect of Rebls that our team is particularly proud of – homeowners and buyers are empowered to do what’s right for them, whether that means working with one of our partner professionals or not. RE: Macro Investor @ 13 – I am also starting a “See Something, Say Something” business where we pay neighbors to ferret out early leads on who might be selling. We also generate revenue from ads, and already have funding from the Department of Homeland Security and the NSA. I’m joining in the fray as well – I’m calling my new business Survivor Suburb, where homeowners can log in and vote the annoying neighbor out of the cul-de-sac. Some members will also be sent to Exile Island, which is a single-wide near Goldbar (it’s only an island every few years, during the wet season). RE: Jeff White @ 14 – This may force some buyer’s agents to turn to an hourly fee billed to the buyer. Not a bad thing, actually. I’ll be interested to hear about transactions that occur via your service. Hurry up and grab 1-800-I-SNITCH. RE: Jeff White @ 14 – As an attorney who regularly handles FSBO deals on an hourly basis I’m pleased to hear that. However, I’m not sure your target market (i.e., agents) will take too kindly to that aspect if it’s emphasized on the site. And, based on my experience handling off market deals I think it’s highly likely that buyers and sellers who come together via your site will be looking for the cheapest option to paper the deal which usually means an hourly rate. I get phone calls from folks like this all the time and they are almost always a variation of: I found this house and worked out a deal with the seller (or, I’m selling my house and I found a buyer) and “we” don’t want to use any agents, can you help us write up the contract? You bet! I have a hard time seeing agents warm to the idea of earning an hourly wage or, for that matter, consumers expecting them to. If you do manage to attract a number of buyers and sellers to your site I fear they won’t end up transacting through agents on a regular enough basis to keep the agents paying for the leads for very long. Hopefully that issue can be figured out somehow. Perhaps standardizing a going rate to paper the deal through an agent. One advantage agents would have over attorneys is they can represent both sides here in Washington (even if I think that’s a terrible idea). My law firm can only represent one side or the other, I can’t even have different associates represent the two sides. I think the bigger challenge for Rebls is attaining a critical mass of buyers and sellers to sell (let’s face it, that’s what you sell). Zillow had the brilliant, if seriously flawed, Zestimate to get eyeballs. I only spent a few minutes on your site and I didn’t see any one compelling feature to entice me to explore further. I think that’s what you need. Even if it’s really only a marketing gimmick like the Zestimate. RE: Jeff White @ 14 – I only spent a few minutes on your site and I didn’t see any one compelling feature to entice me to explore further. I think that’s what you need. Even if it’s really only a marketing gimmick like the Zestimate. I want to revise this statement. I only spent a few minutes on the site because it apparently required me to create a profile to do anything. I am apparently one of the few people out there that dislike this sort of thing so it virtually always deters me from proceeding further. Assuming this does not hold up most people then the compelling feature is “homes you can’t find anywhere else” for buyers and “See Who’s Shopping For Your Home” for sellers. On further thought, that’s pretty good if you can deliver on it. That means you’ve got to get a lot of people to the site, one, and to get them to register and use it, two. That’s what the Zestimate did for Zillow. Perhaps your so new that there aren’t any listings to see yet, or relatively few. As a consumer, I want to see what’s currently available on the site without signing in. I’d get to that as soon as possible. In the early 1990’s I moved back to Seattle from Southern California and found myself looking for work as a commercial real estate lawyer in a down commercial real estate market. The firm I joined had me doing some single family deals for the first time in my career. It bothered me that I was taking on what was likely the largest share of the professional liability in the transaction for a few hundred dollars in fees while the brokers were collecting tens of thousands in commissions per transaction on the high end deals. I considered setting up a couple of attorney run discount brokerages to specialize in high end deals where legal expertise would be valued, one as an MLS member with discounted commissions using non-attorney legal staff with broker’s licenses to show properties and one as an old style non-MLS brokerage, perhaps billing the client for costs plus either a discount commission or an hourly fee, that would advertise directly to high net worth buyers and sellers in appropriate business and social media like the Business Journal, etc. I thought that many sophisticated business people would prefer to have legal representation for their transaction especially if it could be done at a discount over the traditional brokerage model. A business friend of mine who had cut his teeth working for a large national builder talked me out of it when he said something like “Unfortunately I think you may find that a lot more of the high end referrals take place in hair salons than in board rooms.” Sporting a minimalist coif similar to Kary’s I realized that was a venue where I might find it difficult to compete. RE: One Eyed Man @ 21 – I don’t think a lawyer has as much exposure as an agent, if all they’re doing is drafting the contract. Issues about the condition of the property would typically not be something an attorney would be responsible for. I will say though that most people undervalue the benefit of an attorney creating their contract when they’ve already come to terms (or when they are renting the property out), just as most people undervalue the services of an agent. People think they are more capable than they really are. 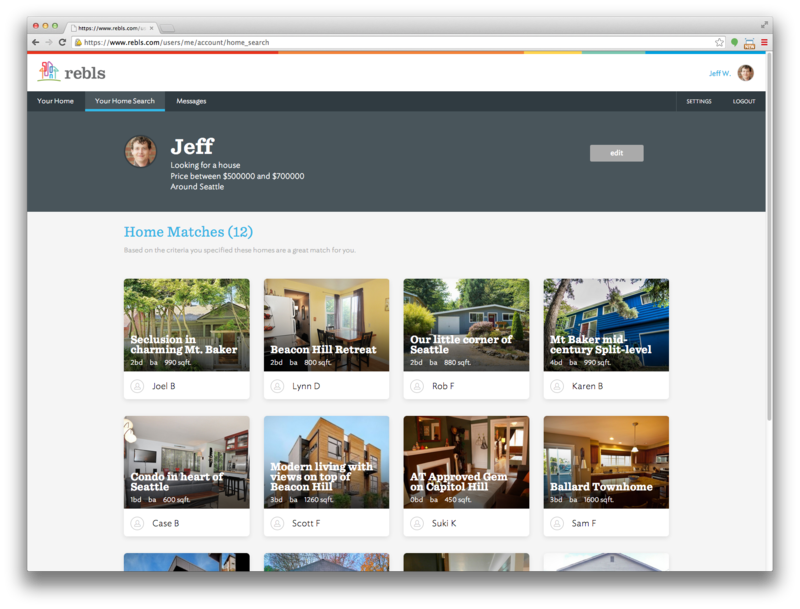 1) The “listing” side of it appears to be similar to Homegain founded by Brad Inman back in 1999. He later sold that company. Not sure where it is now but you may want to track that a bit. Sellers are anonymous and agents provide a ton of info including commission discounts, basically “bidding” for the job. One main difference, primarily due to technological advances since 1999, is that the seller’s home is featured in photos. Most agents can locate the home based on those photos, assuming the sellers have to give a basic location description for the buyers, though not an actual address. 2) The buyer side of it appears to be much like the “reverse prospecting” tool provided by most mls services around the Country. I have never been a big fan of those. In essence as to your site, the buyers emails are all known by the sellers (and even a photo of the buyer it would appear!) but the buyers can’t contact the sellers. Only the sellers can email the buyers (as I read it at the moment on your site) and the pictures and the info including email address of the buyer is known to the seller, but not vice versa. As an agent, getting emails from agents “your client will be interested in my new listing!! !” annoys me. I can find the property using my own search tools, and don’t need them to tell-sell me on what my client will be interested in. It appears the sellers will be able to send emails like this to the registered buyers. I think buyers will find that annoying…because I do. As to PHOTOS of the buyers…that is potentially a Fair Housing violation. You may want to check into that. Sellers should not be able to pick and choose which buyers to contact based on their photos. There are several start ups that deal with “pocket listings” that have been tried over the years. I’m sure you have done your research on that. Correct me on the above as appropriate, as I offer my perspective so as to get more info. My BIG QUESTION is, how do the buyers get inside to see the house? PS to Erik #11 As I read it, this site would also not have all the listings as to incomplete info the same as Zillow…so no, not buying that answer. In fact by design it would have many, many more “errors” in that regard. Buyers and Sellers can clearly use Zillow in the exact same way as Rebls…difference being the buyers CAN contact the sellers, and know the address of the house, without “permission” to get that from the seller…after the seller views the buyer’s info and photo. RE: One Eyed Man @ 21 – I can relate. When I started doing these FSBO deals we charged a flat fee of $795 and were afraid to raise the price for fear that nobody would pay. Good grief! As for the luxury end of the market, what I have found is that I work harder on a $200,000 deal than a $2,000,000 deal. The buyer of the former tends to be a first timer with little to no experience and, therefore, a ton of questions which take time to answer. Fortunately, they greatly appreciate the service we provide so it’s very worthwhile. The $2 mill buyer tends to be on his 3rd, 4th, 5th house and is usually not dealing with a massive percentage of his net worth. Accordingly, they have far fewer questions. But, they do tend to bring pretty high expectations for immediate service and not a lot of patience. Fortunately, we’re usually able to set reasonable expectations and it works out well. This, of course, begs the question, why should an agent make literally 10 times more on the two million dollar deal than the $200k deal. The luxury agent will tell you because the deals get done in the salon. That’s probably true but not in the way they imply. The salon is where the listing agent gets the listing. More often than not, the buyer has their own agent and the deal is done like any other property: Hey, I want to go see this one, says buyer; Ok, let’s go, say’s buyer’s agent. Well good luck competing against the local Real estate Cartel…. If you do well at all they will ensure you either become part of the whole, or your company will be lobbied out of business. The vast fortresses that are the Multiply listing services do not allow successful competitors to remain competitive for long. Of course if you have very mild success you will be nurtured as there needs to at least some pretense of competition…. If I am wrong why are RE transactions as low at .75% in the EU ( yes point 75%). Deep down, I think Tim is getting paid off by redfin to trash other sites and push redfin. I could be wrong, but it would make a lot of sense. More likely is that redfin “sponsored” Tim’s website with cashola and zillow didn’t. Kinda like how boeing sponsored norm dicks if you are familiar with that relationship. It was a matter of time. I’m sorry but that concern sounds ridiculous. I just assume it’s normal to negotiate for a lower or fixed rate when you buy around $1M+. Deep down, I think Tim is getting paid off by redfin to trash other sites and push redfin. I could be wrong, but it would make a lot of sense. More likely is that redfin “sponsored” Tim’s website with cashola and zillow didn’t. Oh man that would be awesome. I wish. The only sponsors I have are the ones with ads on the sidebar. With a good toupee, you might have made millions. I’m sorry, but you’re in no position to assess that. You’re an anonymous poster on the Internet who most certainly has absolutely no legal training and don’t have a clue at all about what I’m talking about. What I will tell you is that the attorney who advises Washington Realtors has issued a similar opinion. As to Marc’s post in support it would also be good to link the opinion which authorizes agents to fill out contracts, so that people can see how limited the rights of agents are. But if you do happen to be an agent and want to risk your license, good luck to you. Otherwise, STFU, because it doesn’t matter to you at all. Yeah, if you get offered money sell out. I would. I think your site is awesome and it may have some pull. Hahaha. Relax man, it’s just real estate. “STFU” is how you reply to people who disagree with you? Shame on you. You diminish yourself by hurling insults instead of supporting your viewpoint. And as a heads up, my RE Attorney would completely disagree with you. He assured me there was virtually no risk to an agent assisting one or more parties in closing a deal. I think you might have been so offended because you have absolutely nothing to back up your claim with..
RE: john @ 36 – Nothing to back up my claim? Quoting a Supreme Court opinion is nothing? And didn’t I say I know agents do what you describe? That some agents are doing things that they shouldn’t is hardly news. I’m not sure you really added anything. But go back and read what I originally wrote and then compare that to what the Supreme Court opinion. In the situation I described about the only brokerage services I would have been providing would have pertained to the inspection, and I would not have been comfortable trying to bootstrap those services into being allowed to collect any kind of significant fee. And again, if something had gone wrong, the likelihood that my insurer would deny coverage would be significant. Question: Seller approaches broker to write a contract for a fee, seller has already procured a buyer and the terms are already agreed upon. Broker represents neither party on Line 16 of the P/S agreement. What forms is the broker obligated to provide to each party for this transaction? Example: Form 17, Agency Law, Lead paint, etc. Answer: Unfortunately, the facts set forth in this question demand an answer that has nothing to do with the question posed. Based on the facts presented, broker should not draft this purchase agreement so the question of which forms to use is never reached. Real estate brokers have a limited license to practice law. The limitations on a real estate broker’s practice of law were defined in Cultum v. Heritage House REALTORS, 103 Wash.2d 623 (1985). . . . . Finally, assuming you really have a RE attorney and that they said what you claimed, I would suggest you find another real estate attorney. If he/she can’t get this basic issue right, who knows what else he/she is getting wrong. Not sure what has you in such a sour mood but it still sounds ridiculous. I’ll believe you that I’m wrong as to the legality and as I’m neither a lawyer or an agent it doesn’t terribly matter to me. I say it sounds ridiculous because if you asked 100 people off the street who you should go to complete a home sale I am willing to be at least 90 of them would say a real estate agent. If it’s using the standard form approved by the brokers counsel they should be allowed to do it in my opinion. I suppose the simple solution is to have someone check the box saying their the agents client and negotiate the fee. This wouldn’t the first time the law and reasonableness didn’t match up to me. I’m just glad agents will do it when I want them to. The point is not what you think or what the link says. The point is that thousands of agents around the Country do this every day, and have for decades. Boater knows that, I know that, and even you admit that. Where is the case…the sanction…the agent punished for it in the last hundred years? Yes, lawyers get mad about this being the truth…but it is in fact the truth. The handful of attorneys online agree with you, so much so that I asked what the punishment was. Answer: “You will be held to the same standard as an attorney.” I was very relieved that the Paddy Wagon wasn’t going to pull up with sirens blasting. I have clearly done this in my 24+ years as has most any agent in the business for any lengthy period of time. Even when I have urged people to use an attorney because it is even cheaper most times than the 1% for both sides that has been the customary charge. But when they say they would feel more comfortable if I did it, after recognizing they could just hire an attorney for less, I’m not going to disappoint them or refuse them. Most often it is not a stranger, it is someone I know very well asking me to do them a favor. boater…he’s not mad at you…he’s mad it happens and he doesn’t like hearing about it. I have been having this “argument” with him and other real estate blogging attorneys in blog comments since February 2006. Oddly though…never in other States before moving to WA. Attorneys in other States are much more helpful and useful in real estate transactions than they are here in WA where everything is big problem by design. Not sure why that is. RE: The Tim @ 6 – That’s right, Tim, there are elements Rebls shares with both the MLS and Zillow, and there are key differences also. First, we’re similar to a MLS in that we publish original content (listings). On the other hand, portal sites aggregate the vast majority of their content from agent listings sent to them periodically from a service called ListHub (owned by Move Inc, which will soon be owned by News Corp/Rupert Murdoch). These listings don’t update every 15 minutes like they would on a brokerage website (e.g. Redfin), but can show up days after a home is listed on a MLS (thus the oft-repeated complaint that portals have ‘stale’ listings). Since our content is original, you’ll never see a stale listing. We’re like other portals in that we don’t operate a traditional brick and mortar real estate brokerage, but rather provide real estate information and connect people with service providers in the industry. We also will advertise other professionals and companies who provide services and products to our users. 1) We list buyers. Instead of focusing on guessing what your home could be worth, we show you the buyers shopping for your homes like yours (your “Buyer Matches”). Algorithms don’t buy homes – people do. 2) We only show pre-market homes. Homes on our site are represented by owners (we’re not a ‘pocket listing’ service). 3) We’re your first step into the market. Any homeowner can feel comfortable creating a Rebls home profile to gauge demand because a) we don’t show your physical address (only a general area on a map), and b) we don’t make homeowners commit to a sale price. We ask for a price range owners would be comfortable selling in, then match them to buyers looking in that price range. 4) We think of real estate in terms of relationships – not just transactions. 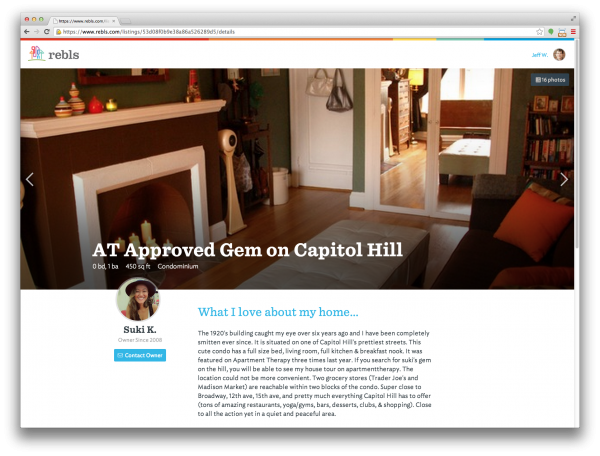 You’ll see this theme all over our site, from the “What I Love About My Home” section featured on every home profile, giving buyers access to the compelling insights and stories which are best told by someone who has lived their life in that home, to the direct message feature allowing users to contact homeowners and their Buyer Matches directly. 5) Rebls is committed to serving the consumer first. This last point may be the most important, and I appreciate Tim mentioning it. We’re not afraid to tell real estate professionals that we take a consumer-first approach. When we do, many of them just smile and nod, because they understand; they have the same focus. It would appear that you are calling the seller the consumer vs the buyers? RE: Ardell DellaLoggia @ 42 – We consider both the buyer and the homeowner (seller, potentially) to be the consumer. Thanks for the question, Ardell. SO years and years of data, showing exactly who what when and where agents have lost licenses , been fined, etc and not one as stated by Larry…. Your assessment is spot on, Marc. Thanks for the feedback. We’re working around the clock on improving the site, and look forward to rolling out some exciting updates soon. Wow Kary! You may be really smart about Real Estate, but it’s apparent you have no manners. I would never utilize your services with that kind of attitude and language. Very unprofessional of you to speak in that manner on a public forum like this.